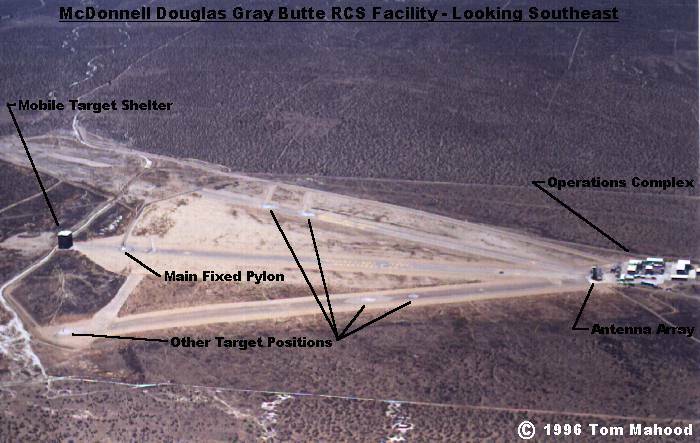 McDonnell Douglas’s Gray Butte RCS facility is located approximately 25 miles due east of Palmdale, on the Los Angeles-San Bernardino county line. It is at the site of an old World War II auxiliary airfield and has utilized the old runways as its ranges. The site address is 25500 East Avenue R-8, Palmdale. This sprawling 4.5 square mile facility is owned and operated by a McDonnell Douglas subsidiary called McDonnell Douglas Technologies. I have heard the facility has been recently sold off to another corporation since Boeing’s acquistion of McDonnell Douglas, but I have no hard ownership data at the moment. 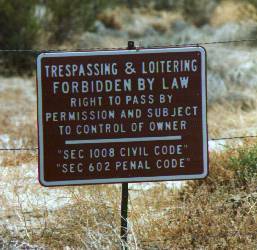 According to the LA County Assessor’s office, most, but not all, of the facility’s land is owned outright by McDonnell Douglas. There are a number of small parcels showing other ownership, so it is a reasonable assumption there are long term lease arrangements in place. This part of the desert is a patchwork of various sized private parcels, and McDonnell Douglas seems to have in place an acquisition program for properties to the north and south. 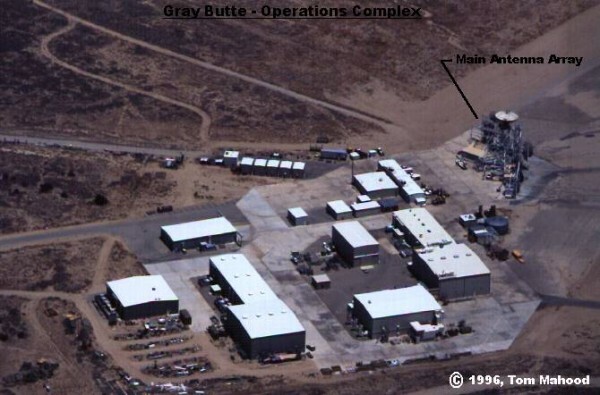 The 1995 assessed value of the facility was $12,896,000 for land, $6,429,000 for improvements and $7,446,000 for “personal property”, for a total value of $26,771,000. As mentioned, the facility is laid out on the site of an old airfield, as shown below. 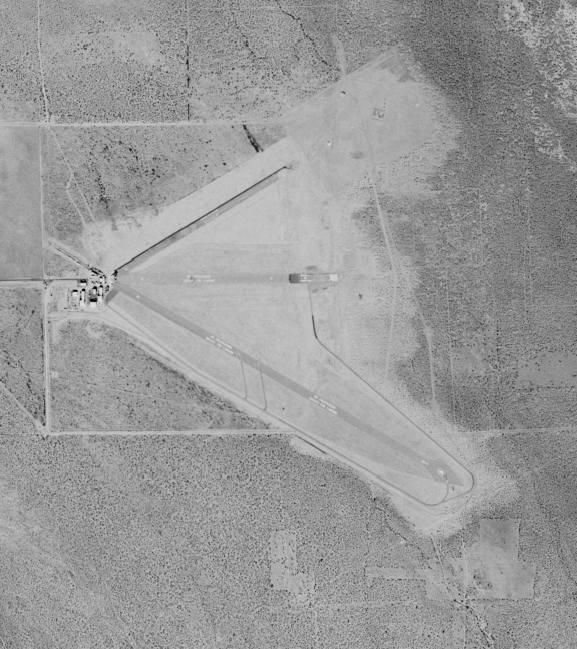 Then there’s a SPIN-2 satellite phototaken of the facility in 1989, with the remnants of the old airfield obvious. From the antenna array at the operations center, located at the west edge of the facility (shown last), three asphalt ranges radiate to the east in a “V” pattern. The central range, which appears to be the main range, has a fixed pylon and mobile target shelter at the east end. 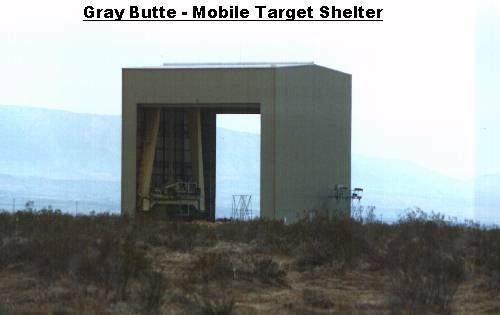 The mobile target shelter, shown below, is a very tall, large metal sided building on rails. Walls on two sides roll up, thus allowing large RCS models to be brought into the structure. The upper part of the building contains a hoist for lifting the models. Once a model is in the building and raised, the entire self-powered structure moves forward several hundred yards to the west on rails to a point directly over the pylon . The model is then lowered onto the pylon and attached. The building then moves back and the testing begins. While the model is housed in the mobile target shelter, it is protected from both the weather and unauthorized observation. 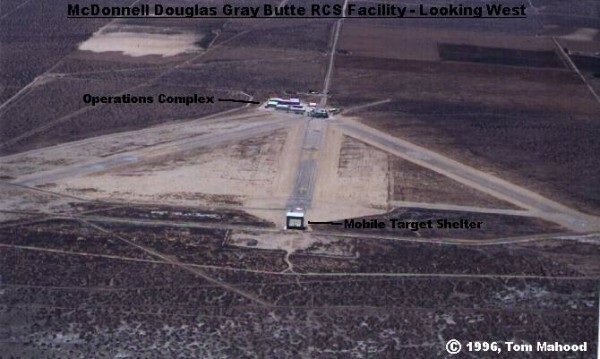 This arrangement is not unique to this facility; Boeing has a very similar layout at an RCS range they own in northern Oregon. In front of the pylon on the center range may be seen a raised berm, in the shape of a chevron, below, constructed of concrete. This chevron is presumed to be an attempt to reduce the ground plane reflections toward the model. By careful placement, a chevron can deflect the radar beams that run parallel to the main beam, but bounce off the surface of the range, and keep them from illuminating the target. These type of reflections can cause a lot of headaches, particularly when measuring in the upper frequency ranges. It appears the northerly range was at one time extended to some distance in excess of 5,000′. However this extension seems abandoned and in disrepair, and is cut through by a flood control channel. The northerly most range also shows some evidence of abandoned and removed structures at its east end. Literature put out by McDonnell Douglas describes three different independent ground plane ranges, varying in length from 1260′ to 3750′. They can test over a continuous frequency range of 145 MHz to 18 GHz, and also spot frequencies of 24 and 35 GHz. 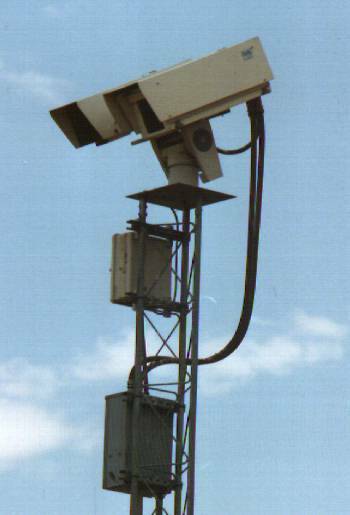 An unusual security feature worth noting is the presence of video cameras along the east perimeter of the facility. 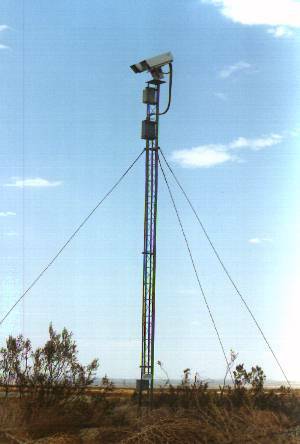 The remotely movable cameras are mounted on masts about every quarter mile. Each camera head appears to consist of two side by side units, so it’s a reasonable assumption one is a standard daylight camera, and the other a low or no light unit. Since these cameras exist only on the east, or downrange side, it may be that their purpose is primarily one of safety, to ensure that no persons are in the strong beam path during tests. In a number of visits to the site, I have never noted the cameras as being active, and they appear to take no interest in visitors. At the end of 1975, Lockheed, not having a range of their own at the time, tested a 10′ wooden model of the F-117A prototype (the “Hopeless Diamond”) at this facility. However that wasn’t necessarily always the case. On my first visit to the site in 1993, there was an interesting structure at the far northeast corner of the property, where a dirt road, adjacent to powerlines, accesses the site. It was a small, slightly depressed concrete structure, that from a distance looked like either a guard station or an electrical vault. Since it was right at the property line, I assumed it to be a guard station and gave it a wide berth. A visit to the same spot a few years later surprisingly found the structure gone, with essentially no trace. I have since seen photos of this structure, and it looks like some sort of utility vault. There was also another small bunker-like structure about a hundred yards to the southeast. 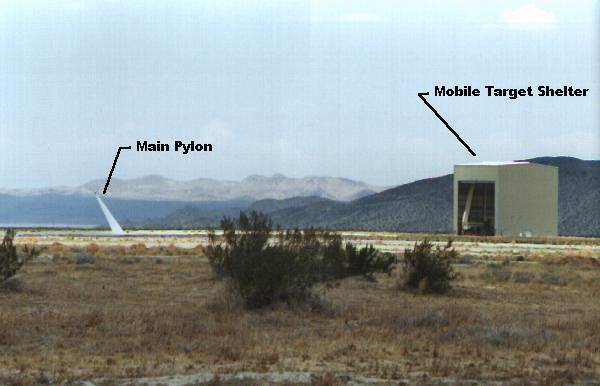 Both of these structures had ventilation turbines on them, perhaps the genesis of the “underground facility” rumors. Close examination of the 1989 satellite photo show them to be there then, but not today. The best guess is they were some part of a program that involved the northerly-most test range, and were removed when the program was completed. Unnecessary structures or objects on an RCS test range can cause complications, so their removal may not be too strange.